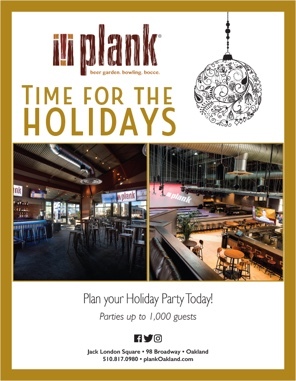 Get to know the plank facility through our Holiday Planning Guide where you will find information about our event spaces, entertainment options, audio visual capabilities and accessibility. Explore our chef-inspired holidays menus exclusively available to you in the month of December. Review the minimum revenue spends which will allow you to narrow down when to host your celebration. Let us plan your event to remember for this holiday season! Explore our event spaces including the coveted Boardroom to better understand capacity, seating vs. reception, entertainment availability, and audio visual capacities. Many of our event spaces boast patio space, special games such as shuffleboard, HDTVs & projections screens for whatever your needs. Regardless of your space, you and your group can enjoy all the plank amenities! To see pictures and take a virtual tour of the facility, click here! Explore our holiday exclusive food & beverage options ranging from mouth-watering hors d’oevres to the Wonder Feast menu, all of which are sure to leave your guests more than satisfied. Whether you need a quick bite or prefer the royal treatment, we’ve got a menu for you. Enjoy one of our three full bars with a customizable bar package including hourly or ticketed options for a combination of beer, wine, standard and premium liquors. Enjoy Arcade Game Play, Billiards in the Ridge or Boardroom, Bocce Ball in the Beer Garden, and Bowling on the full-size Jack London Square Lanes or in the Boardroom on our boutique lanes. Explore the minimum revenue spends set for each event space and day of the week through this holiday season – November 27th, 2017 -January 7th, 2018.